Although some might argue that the Vincentennial ended on May 27th (Vincent Price’s birthday), but we here at Gravedigger’s Local 16 disagree. After all, the US Bicentennial celebration lasted long after the anniversary of the adoption of the Declaration of Independence. Since our celebration started with a review of a Price-related radio drama series, why not end it with another? Disc 1 kicks off with “The Tinglers,” an audio sequel to Price’s 1959 cult classic. Due to the events of the movie Dr. Warren Chapin’s career is in ruins and he’s become addicted to the “fear serum” he had been experimenting with (or as it’s known in the film, LSD). In an effort to help him out, his assistant and sister in law convince him to investigate an African tribe whose garb suggests a connection to the Tingler. As you can guess, things don’t go well for the good doctor’s expedition. Although “Fade Away” starts out as a noir story (with an occasional humorous touch) about a private detective investigating a series of mysterious break-ins at a wealthy client’s home, but does the lack of any physical evidence of a break-in point to a confused old man’s delusions or the supernatural? And why does the butler seem so keen on stopping the investigation? The disc ends with a special bonus: the first half of a recent interview between radio personality Jordon Rich and Vincent Price’s daughter Victoria via phone. Despite the introduction’s warning of the interview’s varying quality, it’s only a small notch under the rest of the CD’s high quality and is very listenable. The interview itself is quite interesting, as it discusses how a renaissance man like Vincent Price, who was initially being groomed as a matinee idol(! ), wound up getting involved in the world of horror. There’s also plenty of fun anecdotes to be found, my favorite involving an Edgar Allan Poe anthology. The extremely effective opening of “Canus” starts off disc two and leads into a twisted variation of the Bluebeard legend involving an insane cyborg dog. I read the partial preview of the original comic on Amazon, I was immediately enthralled by the story potential of a young boy being sent into a dark basement in order to retrieve a ball from a mad dog. Although the story goes in a different direction than I had initially expected based on the comic sample, it’s still a fun ride. Speaking of rides, “Road Rage” brings us the tale of how a nasty ad executive whose “minor accident” turns out to have major consequences. I won’t spoil it by revealing more, so let’s just say that it’s the kind of story that you have to listen to again immediately after you finish in order to fully appreciate it. The CD closes with the continuation of the interview from disc one, which discusses (among other things) Price’s comedic work, favorite movie and some background information on “Thriller” and Edward Scissorhands. This portion of the interview also has Victoria Price (unknowingly) disprove Denis Meikle’s theory as to why her father chose roles like “Egghead” in the 60’s Batman series over the course of his lengthy career. So, does Vincent Price Presents succeed as a radio series about Vincent Price without actually featuring him? Yes and no. Aside from the opening narration explaining the show’s comic book origin, the actual Price connection is slim. 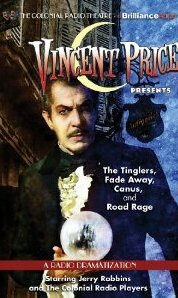 “The Tinglers” features both a character played by Vincent Price and dialogue you can easily imagine him saying, “Canus” hints that we should imagine the father character as being portrayed by Price and the actor playing the ad exec in “Road Rage” has a somewhat Price-esque quality to his voice. I honestly can’t say for sure whether or not it’s a good thing they didn’t use a Vincent Price imitation or digitally manipulated clips from vintage Price works in order to make the connection stronger. All four stories feature top notch acting, music and sound effects. With the exception of “The Tinglers” (more on that later), said stories are wonderfully written. Despite its strong Vincent Price connection, I found “The Tinglers” to be an unworthy sequel to the original. I’m amazed that the comic managed to wring two issues out of its miniscule plot. By revisiting the world of The Tingler, it unwittingly exposes several plot holes in the original that will undoubtedly ruin it for most fans. Although much is made of Dr. Chapin’s addiction to LSD, it goes nowhere and serves no real purpose in the story. Worst of all, “The Tinglers” doesn’t have an ending so much as it just…ends. Given the bizarreness of having a character that was played by Price speaking in a voice that sounds nothing like him, I kind of wish they ditched the spin-off stories and used another name for the show by taking a cue from the Tales from the Crypt TV series and adapting stories from various horror stories from Bluewater Productions’ stable of comics. In any case, it should be noted that the Colonial Radio Theatre on the Air says that the show “…would carry a PG-13 and in some cases an R rating.” Given the gruesome deaths in several tales and the numerous swearing in the final story, I can’t help but agree. While I can appreciate Brilliance Audio’s efforts to keep the price as low as possible, I would glad pay extra for two factory-pressed CDs in a jewel case rather than two CD-Rs in paper sleeves (with styrofoam padding) in cardboard packaging. On the plus side, they used the more professional-looking CD-Rs with metallic tops. Special thanks to Brilliance Audio for the review copy!